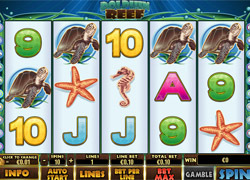 Dolphin reef is a 5 reel, 20 payline playtech slot with an undersea theme. The bonus feature is activated when the dolphin lands on reels 2 and 4 and 5 free spins will then be awarded. The reels 2 and 4 expand with 3 dolphins leaping from reel 2 to reel 4 during the free spins! These reels then become wild symbols.